A year ago, we shared with you our belief that Algorithm Development is Broken, where we laid out the problems in the world of algorithm development, and our vision of how to make things better. Since then, we’ve been working hard to create our vision of the world’s first open marketplace for algorithms – and you, the developers of the world, have enthusiastically joined us to help active the algorithm economy. Today, we are proud to open our doors to the world, and deliver on our promise of a global, always-available, open marketplace for algorithms. For the first time, algorithm developers can publish their algorithms as a live API and applications can be made smarter by taking advantage of these intelligent algorithms. Composable: algorithms are building blocks, build something bigger! For algorithm developers, Algorithmia provides a unique opportunity to increase the impact of their work and collect the rewards associated with it. For application developers, Algorithmia provides the largest repository of live algorithms ever assembled, supported by a vibrant community of developers. So far, users have contributed over 800 algorithms, all under one API that grows every day. The most exciting thing from our point of view is watching the Algorithmia Marketplace grow and expand in its functionality. Thanks to the thousands of developers who joined our cause, contributed algorithms, and gave us countless hours of feedback so far. We are very excited to be opening our doors, and we look forward to helping you create something amazing! Interested? Join the largest marketplace for algorithms in the world. Links in this post require access to Algorithmia.com private beta – you can obtain access by just following this link. Inspired by @sampullara’s tweet we started thinking about how we could create an N-gram trainer and text generator directly in Algorithmia. It also happened to be almost Valentine’s day, so we wondered if we could apply the same principles to automatically generating love letters. Although it is clear that we probably wouldn’t be fooling our valentines with the fake letters it was still a fun exercise. query the model for automatically generated text. N-gram models are probabilistic models that assign probabilities on the “next” word in a sequence, given the n-1 previous words. The power of n-gram models are limited in natural language processing due to the fact that they cannot model deep dependencies, that is, the nth word only depends on the n-1 previous words; but they perform well on simple statistical demonstrations. A quick internet search on love letters provided us with enough of a corpus to extract some trigrams. Algorithmia already had a convenient way to extract text from given URL’s, and this is our data source for our love letter generator. Now we are ready to feed in our love corpus into the trigram generator. The extraction of trigrams is done with an algorithm that generates trigram frequencies. This algorithm takes in an array of Strings (the love letters in our corpus), a beginning and an end token, and a Data collection URL to write the final trigram frequencies. The beginning and end tokens are necessary for us to be able to generate sentences. There are word sequences that are fit to start a sentence and those that are fit to end a sentence. To be able to discern these, we use beginning and end tokens that are unique and they do not show up in the text, so instead of hard-coding them, we take them as inputs. After the small preprocessing step, we can go through the text and generate the frequencies in which they appear. This step can be referred to as the “sliding window” step where we go through each three-word (or word-token) combinations and keep recording the frequencies. The implementation details can be seen in the GenerateTrigramFrequencies algorithm. We record the output as the three words followed by the total frequency in a file. Now we can pass the trigram model that we obtained to the RandomTextFromTrigram algorithm. If we think of the trigram groups as possible paths to be taken down a graph, randomly choosing one of the possible nodes limits our choices already. By going from the start of the graph to the end and choosing randomly from our possible “next words”, we generate random text based on the original corpus. And last as @sampullara tweet originally suggested we applied the same process to collect tweets by a user. We added an option to specify gram-length for the tweet generator. This was done due to the fact that, if there are not enough alternatives with different frequencies, the probabilistic nature of the generation of text is not very visible at the end result. Since tweets are generally short and fairly unique, trigrams do not result in very interesting combinations. Note:we limit the number of tweets to be retrieved from a user so Twitter API doesn’t rate limit us. Want to try this yourself? All algorithms used for this blog post are online, available and open-source on Algorithmia. You can get private beta access by following this link. We here at Algorithmia are firm believers that no one tool can do it all – that’s why we are working hard to put the world’s algorithmic knowledge within everyone’s reach. Needless to say, that’s a work that will be in progress for awhile, but we’re well on the way to getting many of the most popular algorithms out there. Machine learning is one of our highest priorities, so we recently made available two of the most popular machine learning packages: Weka and Mahout. Both these packages are notable for different reasons. Weka is a venerable, well-developed project that’s been around since the 80’s. It includes a huge suite of well-optimized machine learning and data analysis algorithms as well as various supporting routines that handle formatting, data transformation, and related tasks. Weka’s only real weakness is that its main package is not well optimized for memory intensive tasks on large datasets. Mahout is almost completely the opposite, being something of a cocky newcomer. It’s a recent project designed specifically for Big Data. Its set of algorithms seems tiny compared to Weka, its documentation is spotty and getting it to work can be a real headache (unless of course you’re using it through Algorithmia). However, as our results below show, if you have much data to crunch, it may be the only game in town. Mahout is designed to scale using MapReduce and while integration of MapReduce into its algorithms is neither complete nor easy to use, even in the single machine case, Mahout shows evidence of being more capable of handling large volumes of data. As you probably figured out already, it depends. There are any number of ways to answer this question, but we opted to compare them by picking a popular algorithm present in both, and comparing performance on a well known and non-trivial machine learning task. Specifically, we applied random forests to the MNIST handwritten digit recognition dataset. The MNIST dataset is consists of handwritten digits. Note that we did work with a reduced subset of the dataset that has about 42000 images for training and 28000 for testing. Random forests are an ensemble classification method that enjoys great popularity due to their conceptual simplicity, good performance (both speed and accuracy for many applications) and resistance to overfitting. You can read more about them here or, of course, on Wikipedia. 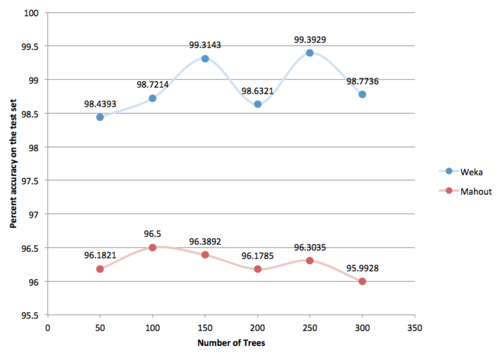 Despite differences in the implementations, all parameters apart from the number of trees were kept constant for the purpose of a fair comparison. For accuracy, Weka is the clear winner, achieving its best accuracy at 99.39% using 250 trees, compared with Mahout’s best: 95.89% using 100 trees. It’s also worth noting that the number of trees had little effect on Mahout’s classification accuracy, which stayed at between 95 and 96 percent for all forest sizes tried. Runtimes for both were comparable. This shouldn’t be terribly surprising, as Weka has been around for longer and we would expect to be at least somewhat better optimized, especially in the relatively small datasets for which it was specifically designed. However, bear in mind that this MNIST is easily small enough to fit one one machine. Weka’s superior accuracy won’t count for anything once your data outgrows this and tools like Mahout will be your only option. So, it’s just like we told you. When taking into account the whole scope of enterprise data problems, there is no clear winner or one-size-fits-all solution. If you have a little data and want to get the most out of it, use Weka. If you have a bunch of data, Mahout is your best (or perhaps only) choice, even if performance isn’t quite what you would like. One of the key advantages of Algorithmia is that you can easily try both head to head against your data set with no setup. As developers one of our biggest “problems” is our voracious appetite for news. From Twitter to HackerNews to the latest funding on TechCrunch, it seems, at times, we cannot avoid the gravitational pull of our favorite news feeds. I know, at least for myself, this is engrained in my routine: wake up, check Twitter, check TechCrunch, check The Verge, etc. I spend at least the first 30 minutes of every day reading feeds based on title and repeat this a couple more times through the day. Get the code sample for this project here. I recently discovered SkimFeed, which I love and call my “dashboard into nerd-dom,” basically it is a single view of the major tech sites’ titles. However, I wanted more information on each article before I decided to click on one, so I thought: Why not use text analysis algorithms as a more efficient way of consuming my feeds? SentimentAnalysis – Analyzes sentences for positive, neutral or negative connotation. Uses the Stanford NLP library. Now, it was just a question of making them work together (and it took ~200 lines of code). The first thing I needed to do was retrieve all the necessary elements from the RSS feeds (ScrapeRSS). Once I had located the main content I could strip all the unnecessary HTML (HTML2Text). Now I had a nice clean body of text to start doing analysis on. Creating topic tags is an easy way of understanding an article at a very quick glance, so I fed our clean body of text through AutoTag. Now I had the RSS title and some topics, next step was to summarize each link into 3 sentences max to complement the tags. Finally, and mostly for fun, I wanted to see if it’s true that most news is negative, so I added SentimentAnalysis. You can check out some of the code here (or just view-source on our demo page in the browser). That’s one way to use the Algorithmia library to build your own text analysis API to analyze almost any data stream in < 30 minutes. .